Wing Chun is not a technical style. It is a conceptual system. More than a set combinations of pre-conceived movements, it is an ingenious index and guide to the core principles of Southern Chinese martial arts. Thus, in the Wing Chun system of Yuen Kay San as taught by grandmaster Sum Nung, it is the yiu dim (yao dian, important pointers) that are vital, since from them come the many individual applications and implications. There are many important concepts in Wing Chun such as "simultaneous defence and counter offense", "techniques come from the heart", "sticking hands is like asking the way" and one of the most important, the "centre line". Wing Chun seeks advantage by aligning its structure and weapons on the central meridian, striking the opponent's center of balance and maintaining dominance of the line between the two throughout combat. In addition to the general principles, Yuen Kay San left behind several formal written sets in poetic form, including the sup yee faat (shi er fa, twelve methods). It is a group of keywords organized by Yuen Kay Shan and Sum Num to express their core concepts. 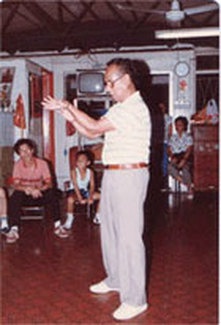 Practitioners of the Yuen Kay San / Sum Nung Wing Chun lineage apply these methods together with their techniques during applications. The twelve methods provide a gateway to deeper understanding of the style. Anyone who fights purely with techniques without these methods will not possibly be able to execute them to the fullest potential. Although each of the twelve methods can be interpreted and applied in different ways, basic explanations can help give insight into their potential. Bridging is to make contact with the arms. Intercepting involves stopping the opponent's strike on his way in before it gets too close. Sinking deals with the destruction of the opponent's structure. Darting advocates the relaxed and accurate thrusting of power. Sticking relies on contact to gather information. Feeling uses contact to maintain positioning during the dynamics of combat. Pressing applies power like an iron on clothing. Swinging turns the reactions of opponents against them. Swallowing accepts an opponent's power instead of resisting it. Slicing carves into an opponent to disrupt their center of gravity. Stealing fills the empty holes in an opponent's defense. Leaking runs through an opponent's actions. Tactical advice is passed down in the system through sets of four character rhyming couplets such as the yiu ku (yao jue, important rhymed formulae) and the similar faat mun (fa men, methodologies). These formulae impart advice including; as force comes, it should be received and kept. It is never resisted or knocked away but accepted and adhered to. As force goes, it is accompanied, escorted back, and added to. When a loss of contact occurs, or the body is crossed, a practitioner is advised to charge straight down the central meridian. Wing Chun kuen does not prepare or plan out ahead of time and stubbornly enact these plans regardless of circumstance. It attacks according to current conditions and is alive and ever changing. Every offense is a defense and each defense is an offense. When changes are done skillfully, a practitioner can achieve twice the results with only half the effort. Wing Chun kuen boxers must learn to apply their power in the most advantageous way, moving with the wind rather than against it. Its power is soft, calm, and quiet. Practitioners must therefore have faith in themselves to use it. Soft is employed to overcome hard, but both hard and soft are combined in use. Enemies are fought fiercely and attacks may be initiated in order to gain control. Once an initial attack is made, it is followed in succession until the target is no more. Sets of five character rhyming couplets pass along training principles in the Yuen Kay San system. 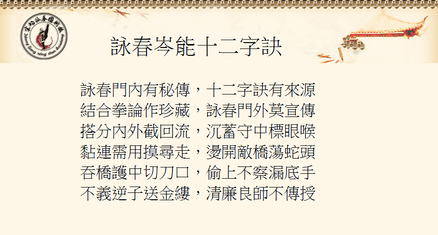 They include the yiu jee (yao zhi, important ideas) and the ching yan (qian yin, introductions). These sets relate to working hard, being healthy, studying, being nimble, using the eyes, and being first. Some of the training principles include that strength must be exacting in position, never overextended. It is aware, follows, and changes with feeling. During training, the eyes should be angry and look straight forward. Changes should be explored through sticking with a partner. A teacher must correct these practices. When there is no teacher and no partner, a mirror and dummy should be used to aid in this pursuit and one must imagine an enemy is present. In addition, practitioners are advised to follow the methods of the ancestors, but to remember to change according to conditions. Lastly, it is said that if one works hard and trains, one is unlikely to meet with failure.